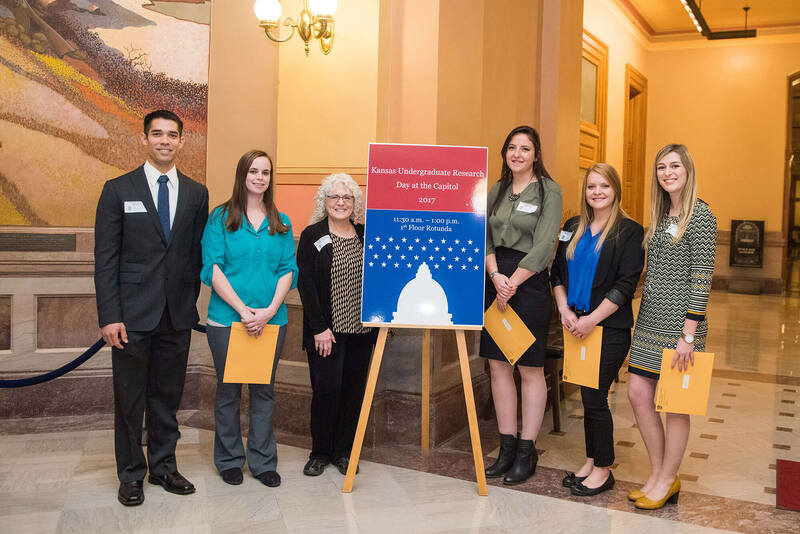 Fort Hays State University students will join their peers from other Kansas Board of Regents public four-year universities in Topeka for the annual Kansas Undergraduate Research Day at the Capitol on Wednesday, February 14 from 11 a.m. to 1 p.m. in the Capitol rotunda. 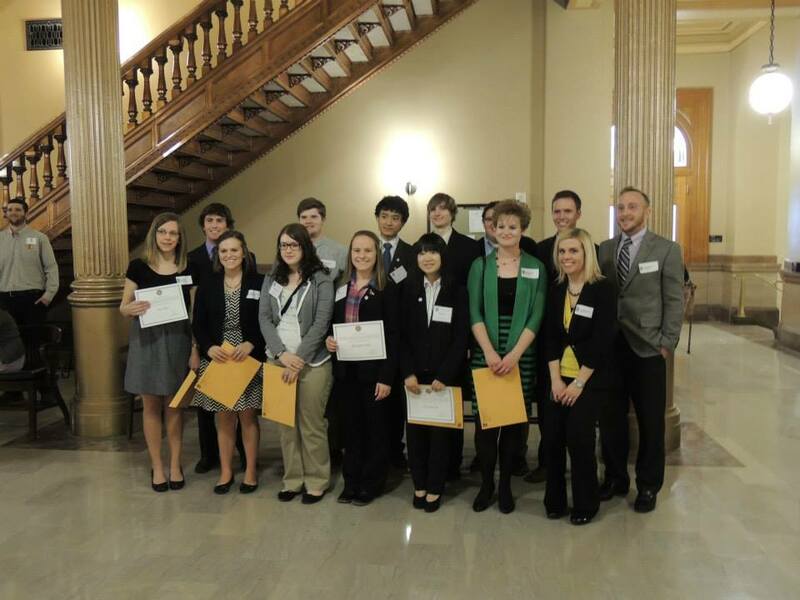 Participating students will present their research projects to legislators and the general public.  The purpose of this event is to demonstrate the unique opportunities undergraduate and graduate students have to participate with faculty members in research at KBOR universities. This event will showcase the work of up to 40 Kansas undergraduate students representing each of the state’s eight public 4-year institutions. This event will also emphasize higher education’s role in developing educated citizens and preparing a workforce with the necessary skills to further the economic growth of the state. Ashley Lockwood, Great Bend, KS (Psychology, Senior) Studying Stigma: Assessing Stigma of Mental Illness Toward Juveniles (Ms Brooke Mann, research mentor). Sara Nansel, Hays, KS (Biology, Senior) Isolation of Soil Microbes to Test Against ESKAPE Relatives for Antimicrobial Properties (Ms. Claudia da Silva Carvalho, research mentor). Annie Hinds, Wichita, KS (KAMS, Sophomore), Kansas Gifted Education Database (Runfan Yang and Dana Kang, co-investigators) (Dr. Linda Smith, research mentor). 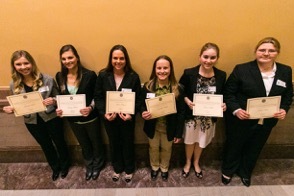 Congratulations to the students selected for the 2017 Undergraduate Research Day at the Capitol! Chelsea Wheeler (Psychology and Criminal Justice - Senior - Hays, KS) - "Perceptions and Decisions Made by Jury Members on Educator-Student Sexual Abuse." Research Mentor: Dr. John Raacke. Jennafer Ball (Biological Sciences - Junior) Co-Investigator Whitney Mulder - "Bioprospecting for Antimicrobial Producing Organisms in Soil." Research Mentor: Ms Joanna Fay. Keri L. Caudle, senior majoring in Biology; Hays; "Effects of extreme drought on photosynthesis and water potential of Andropogon gerardii (big bluestem) ecotypes in common gardens across Kansas" investigated how drought affects prairie grasses; research mentor: Dr. Brian Maricle, Department of Biological Sciences. Michael Cory, KAMS sophomore; Wichita; "The Effects of Copper Exposure on Mammal Cells," examined the way copper leads to cell death; research mentor Dr. Thomas J. Wiese, Department of Chemistry. Kayce Feldkamp, KAMS freshman; Seneca: "Effect of Nine Volt Direct Current Charge Applied to Radishes and their Growth" investigated the effect of electricity on radishes; research mentor: Dr. Paul Adams, Departments of Physics and Teacher Education. Seth Gooding, senior majoring in chemistry; Hays; "Implications of Local Cultural Variations for the Strategic Use of Legal Flexibilities in China" interviewed international managers and lawyers in China; research mentor: research mentors Dr. Justin Evans and Dr. Tony Gable, College of Business and Entrepreneurship. Jessica Havice, senior majoring in communication sciences and disorders; Abilene; "Sound Intensity Measurements of a University Marching Band during Rehearsals" found that prolonged exposure to the sound levels generated by the marching band may cause hearing loss; research mentor: Dr. Fred Britten, Department of Communication Sciences and Disorders. Xining Li, KAMS freshman; China; "Terminal Velocity of Meteorite" used a wind tunnel experiment to determine that the shape of a meteorite impacts its terminal velocity; research mentor: Dr. Paul Adams, Department of Physics and Teacher Education. Xiaoying Lin, KAMS freshman; China; "The Impact of Population Density on the Intensity of Urban Heat Island Effect in Manhattan, New York and Saratoga Springs, New York from 1960 to 2012" explored the relationship between population density and historical temperature data; research mentors; Dr. Paul Adams, Departments of Physics and Teacher Education and Dr. John Heinrichs, Department of Geosciences. Leah Piper, senior majoring in communication studies; St. Marys; "A Closer Look at the Costa Concordia" analyzed the types of image restoration strategies used following the cruise ship disaster; research mentor: Dr. Leslie Reynard, Washburn. MaRyka Smith, KAMS freshman; Hoyt; "The Relationship of the California Horse Population and Grassland in the Sierra Nevada Eco Region" investigated the relationship between wild horses and grassland environment; research mentor; Dr. Paul Adams, Departments of Physics and Teacher Education and Dr. John Heinrichs, Department of Geosciences. Adam Wilbur, senior majoring in graphic design; Wichita; "The Role of the Entrepreneurial Lawyer in Small Firms in China" analyzed the legal environment in China for small firms; research mentors Dr. Justin Evans and Dr. Tony Gable, College of Business and Entrepreneurship. 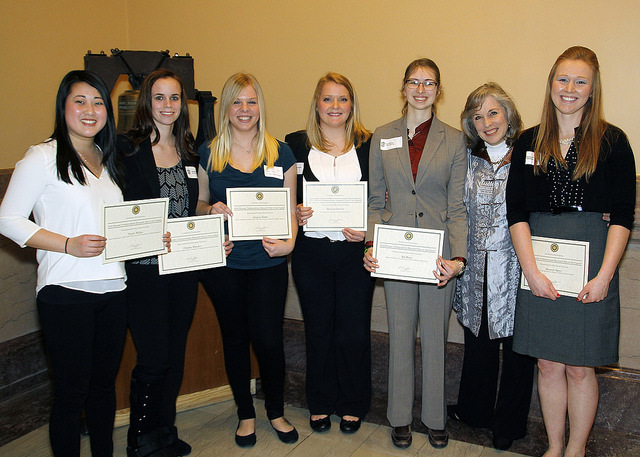 Ten Fort Hays State University students attended Kansas Undergraduate Research Day at the Capitol in the rotunda of the Kansas State Capitol Building in Topeka on Wednesday, April 3, 2013. Jeff Carter, Biological Sciences-Carter presented his research project "Changes in the migration timing of twelve passerine species over a 45-year interval in the High Plains." Keri Caudle, Biological Sciences--Caudle presented her research project "Effects of flooding on photosynthesis and root oxygen stress in plants of different flooding tolerance"
Brad Leupold, Biological Sciences/KAMS-Leupold presented his research project "Effects of high-energy Beta radiation in the upper atmosphere on antibiotic resistance in Escherichia coli." Katharine Goebel, Geosciences/KAMS-Goebel presented her research project "The correlation between climatic factors and malaria rates in Ghana." Laura Rook, Geosciences/KAMS-Rook presented her research project "The annual increase of carbon dioxide in relation to the frequency of major hurricanes in the Pacific Ocean (1992 - 2009)." Ryan White , Geosciences-White presented a group research project "Sea ice dynamics in Northern Baffin analyzed using ICESat and MODIS." Laura Rokey, Health and Human Performance and Communication Sciences and Disorders/KAMS-Rokey presented her research project "Warning: Exercise may be hazardous to your health." Melanie Mabrey, Psychology-Mabrey presented a group research project "Examining the connection between Facebook wall posts and romantic relationships." Hayley Disney and Quentin Aker, Biological Sciences/KAMS-Disney and Aker presented their research project "Effects of drought on Kansas turf grass."